The Teaching Tolerance website is quite user-friendly but it’s not as useful as I’d like it to be as a future teacher pressed for time when writing lessons. 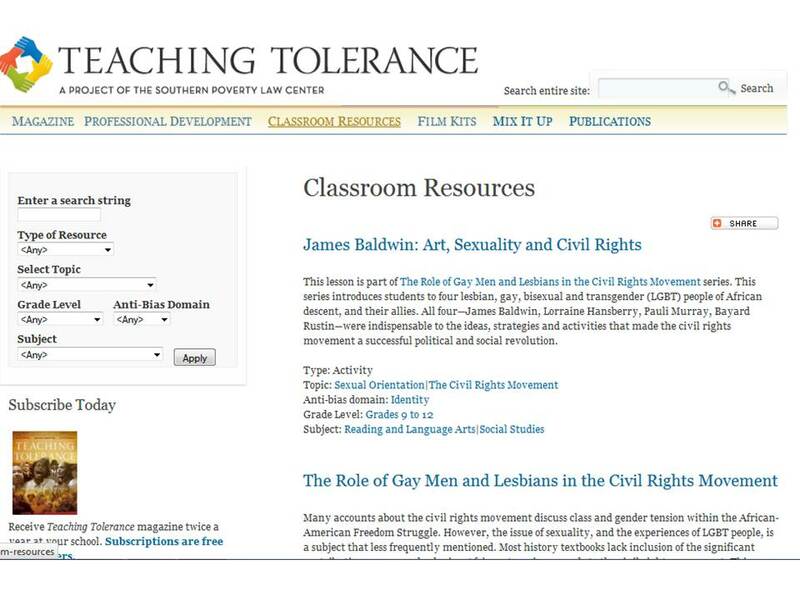 (Teaching Tolerance is part of the Southern Poverty Law Center.) The lessons and activities aren’t presented in lesson or activity format so really the teacher would have to write a lesson plan almost from scratch while coming up with the objectives while backing it up with standards. The information is good (for the most part) and the resources at least give ideas for what to do in your classroom. The information is organized by subject, grade level, and other options to fine-tune the search. The site is history-based and focuses on racism, sexism, empowerment to minorities, immigration, LGBT figures, poverty, and more. I foresee using these resources as parts of lessons, not as whole ones themselves. For example, when teaching about the civil rights movement, I’ll bring in pieces from this website about women and LGBT activists or how we have stereotypes of others. These activities/lessons could also be used in an English class when reading books about the Holocaust or have characters who are of a minority, and/or face racism or any other instances of intolerance. Lots of options here. Really, the website is about realizing our biases and stereotypes and then acting on them to make the world better. My fear is that using too many of these lessons would stray too far from the dreaded “standards,” but I think that any good teacher can incorporate these lessons in a smart way that enhances student understanding of the subject and the standards. My other fear is parents being upset that I teach about these topics, namely LGBT lessons. I feel these lessons can be justified by saying that it’s history, not an agenda. They were there. They did stuff. They deserve a voice just like everybody else. Previous Advice on Tests Next Free Supplies!